A comprehensive sunscreen with antioxidants for all skin types. This broad spectrum SPF 50 sunscreen for all skin types helps prevent sunburn, decreases the risk of skin cancer and early skin aging caused by the sun. 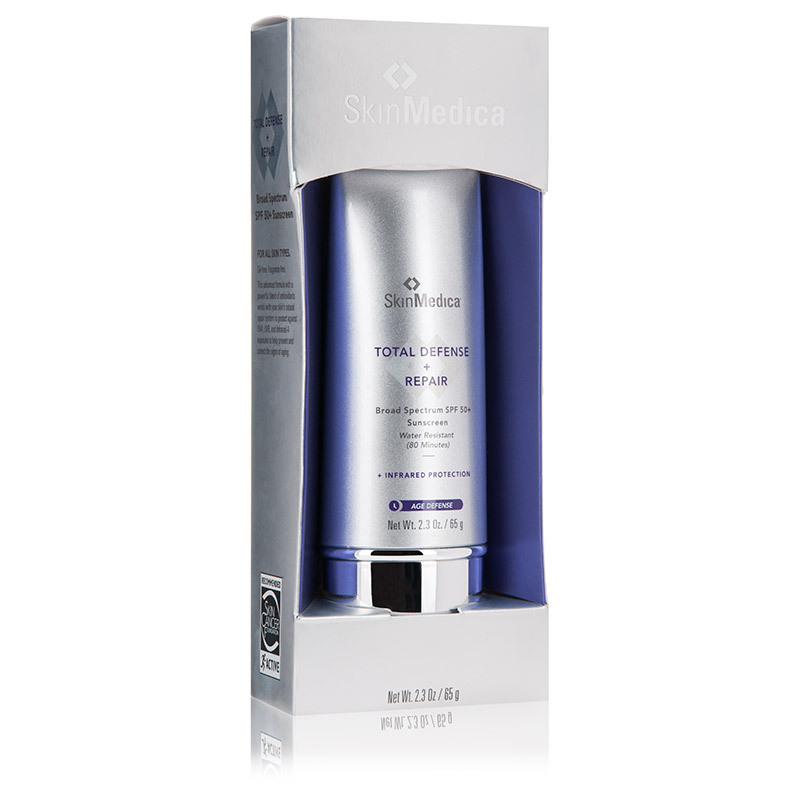 Sunscreen is the most direct way to prevent aging and SkinMedica Total Defense + Repair SPF 50 provides broad spectrum protection for your face and body against harmful UVA and UVB rays and infrared waves.This sunscreen features SOL-IR™, advanced antioxidants that combat free radicals and boost your sunscreen’s ability to shield your skin against sun damage. With a lightweight texture that leaves no white residue behind, you can wear it with or without makeup for daily sun safety. In addition to protecting skin, each application helps revitalize your complexion to erase fine lines and wrinkles and even skin tone and texture. 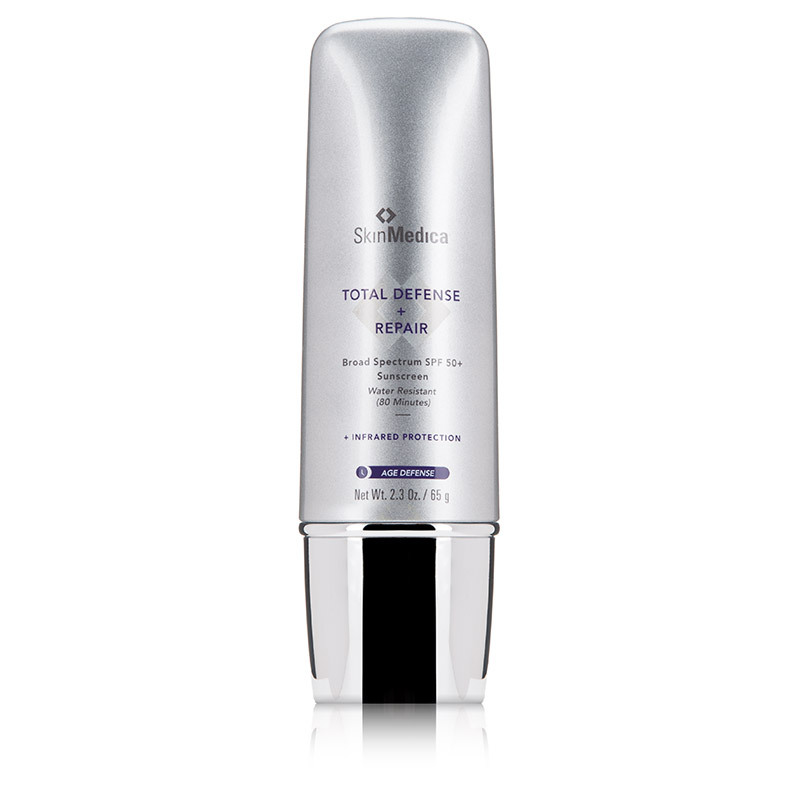 Renew your skin with this water-resistant formula that wears for up to 80-minutes and reapply regularly for total coverage. Active: Octinoxate 7.5%, Octisalate 3.0%, Zinc Oxide 8.0%. Inactive:Water, Caprylic/Capric Triglyceride, Butyloctyl Salicylate, Styrene/Acrylates Copolymer, Niacinamide, Silica, Glyceryl Stearate, PEG-100 Stearate, Cetearyl Alcohol, Squalane, Polygonum Aviculare Extract, Physalis Angulata Extract, Dunaliella Salina Extract, Ubiquinone, Glycerin, Camellia Sinensis Leaf Extract, Melanin, Tocopheryl Acetate, Tocopherol, Hydroxyacetophenone, Batyl Alcohol, C12-15 Alkyl Benzoate, Butylene Glycol, Ceteareth-20, Polyhydroxystearic Acid, Isostearic Acid, Acrylates Copolymer, Xanthan Gum, Ethylhexylglycerin, Disodium EDTA, Caprylyl Glycol, Sorbic Acid, Phenoxyethanol.